Nearly one in five mortgage-holders has an interest-only home loan, meaning they would need savings or other funds to pay a final lump sum. 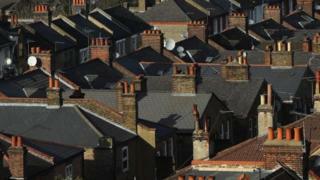 The Financial Conduct Authority (FCA) said the end of these mortgage terms would peak in the next 10 to 14 years. Many borrowers were ignoring letters from lenders, it found. Interest-only deals allow borrowers to pay off the amount borrowed only when the mortgage term ends, usually after 25 years, but there is concern that a host of homeowners do not have plans in place to pay the final bill. One peak of these final bills has come in the past year or so, for those who took out endowment policies in the 1990s and 2000s. Less affluent, middle-aged homeowners who often converted to interest-only deals in 2003-09 - who are concentrated in the South West, East and North West of England, as well as London and the West Midlands - will see their final repayment demand come in 2027-28. The regulator said that lenders had improved their communications with customers at risk since its initial report on the issue five years ago. However, there were still concerns that some customers may have been incorrectly reassured about their plans by non-specialist staff. The FCA had more concerns over the reaction of borrowers who, for a variety of reasons, were ignoring letters from their lender. Some believed that they had an adequate repayment plan in place, while others were simply burying their head in the sand. Some had little trust in their lender, so were suspicious of the letters. The FCA urged these borrowers to talk to their lender as early as possible, otherwise they would restrict their options over time of paying off their mortgage. "We are very concerned that a significant number of interest-only customers may not be able to repay the capital at the end of the mortgage and be at risk of losing their homes," said Jonathan Davidson, executive director of supervision at the FCA. Hannah Maundrell, from comparison service Money.co.uk, said: "You may be able to remortgage your property, extend your mortgage to give you time to raise the money to pay it back or look into taking out another mortgage from a different lender. "If you're at risk of losing your home, there are government schemes that could help. The key thing is to pick up that phone and talk to your lender."